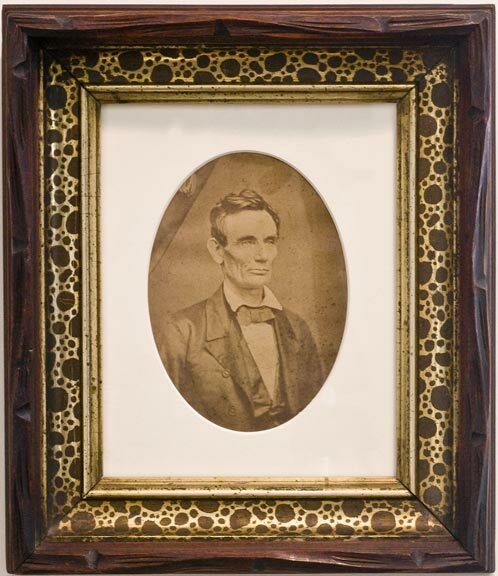 Best - A very unusual and attractive, large American ripple frame varient with a composition repeating ripple pattern from about 1850-60. This is the first that I have seen of this style of ripple. It is 19 x 24 3/4 inches o.d. and has a 16 x 22 inches pic. size. 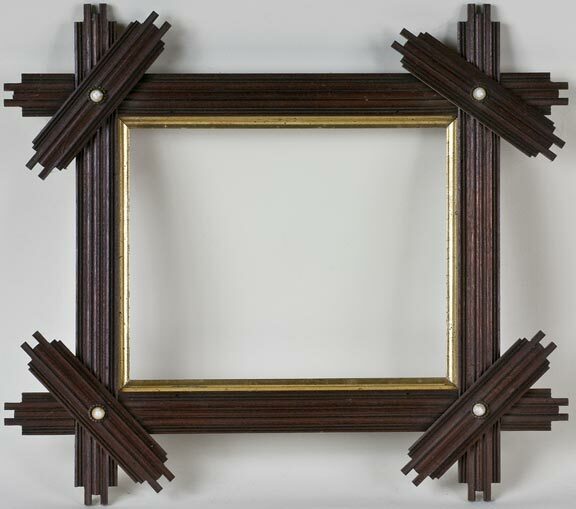 A superb 1855 walnut frame with a gold inner crosswork that would hold 4 quarter plates or CDVs. It is 10 x 12 inches od. and has (4) 3 1/4 x 4 1/4 inches pic. size. 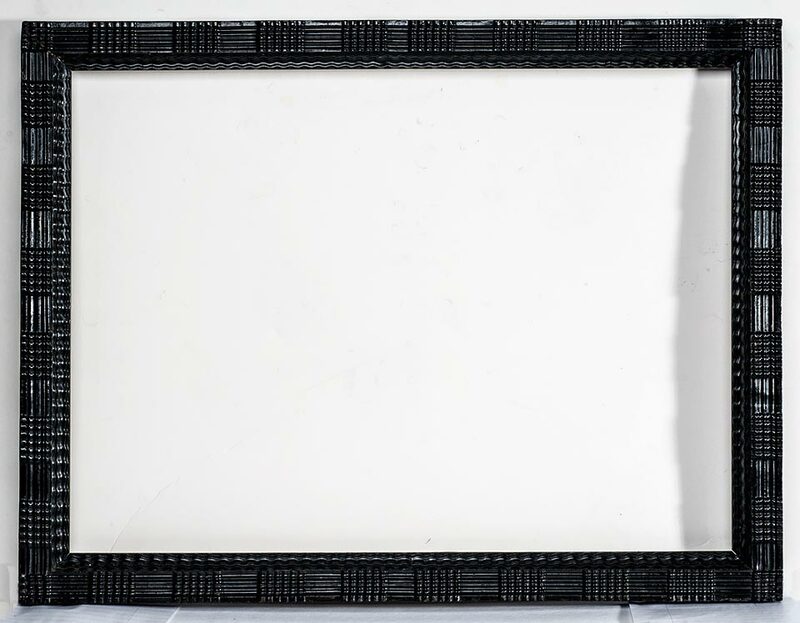 Best - An unusual Mahogany, multi-image frame with crisscross corners, white porcelain beads, and a mirror, that would hold 30 CDVs. It is 24 3/4 x 31 3/4 inches od. and has (24) 2 1/2 x 3 3/4 inch pic. size. The top row is a touch shorter at 2 1/2 x 3 5/8 inches. 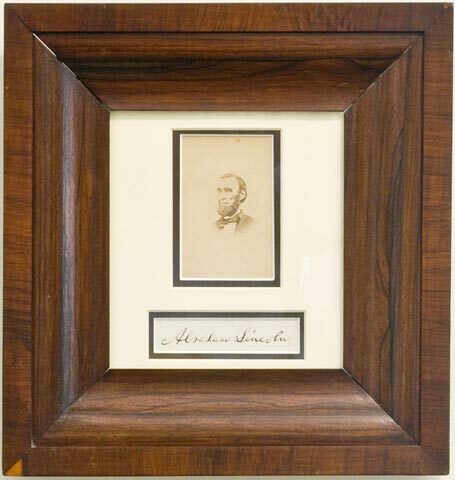 Best - A beautiful two-tone mahogany example sized to hold a small, oil portrait or daguerreotype photograph from 1840-1850. 7 1/4 x 7 1/2" od. 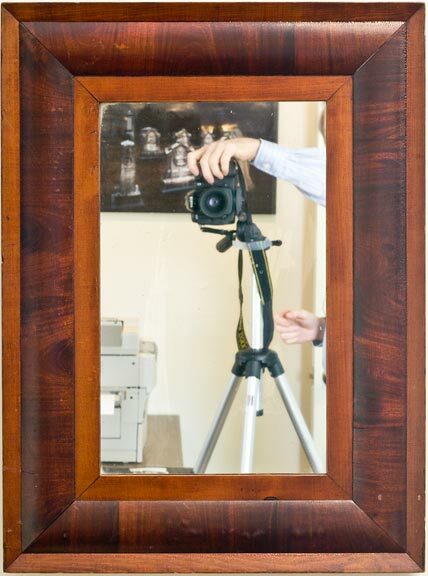 Best - Rare 1850 beautiful birdseye maple veneer in the style of an 1850s mahogany mirror frame. It is 22 x 31 inches od. and has a 14 x 23 3/4 inches pic. size. This is the 1st birdseye maple frame like this that I have ever found. 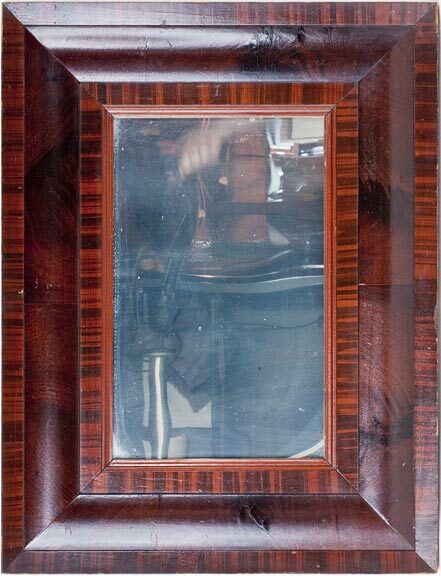 Best - An nice quality 1840s-50 mahogany veneer. Note that it has a separate applied outer rim and inside rim, both signs of a higher quality of craftsmanship. It is 12 7/8 x 15 inches od. 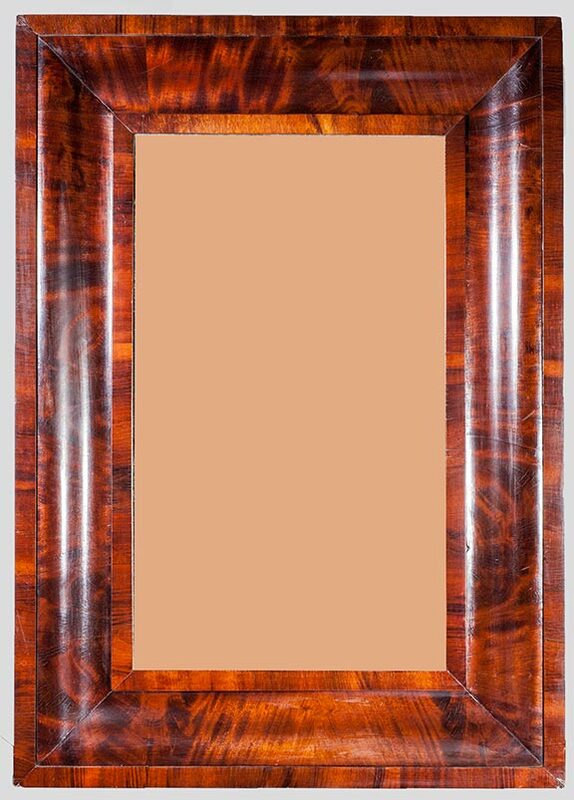 Good - An 1840s-50 mahogany veneer. 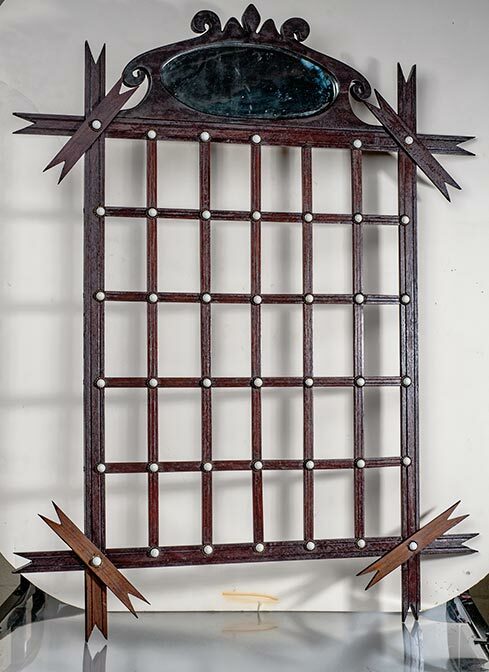 This type of hanger (on top) was phased out by the mid-1850s. It is 13 1/2 x 16 1/2" od. 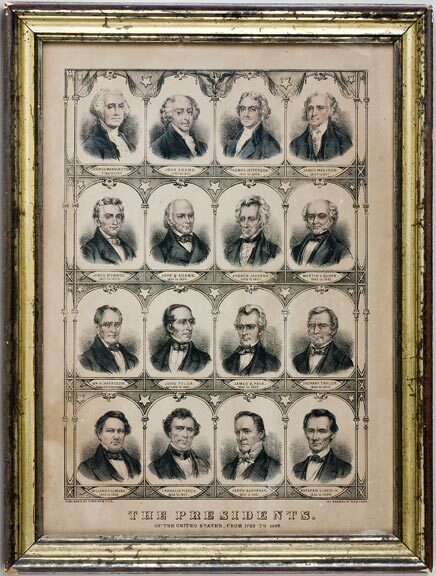 often called Currier & Ives-type frame. 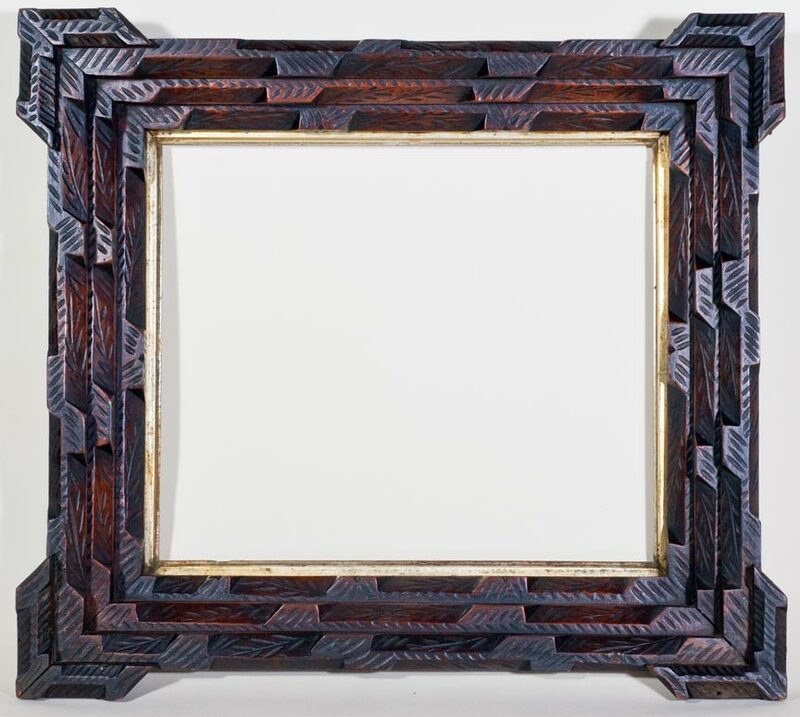 Best - An 1850s English rosewood piece with exceptional graining and a gilded liner. Rosewood is a protected wood now and no more is being gathered. 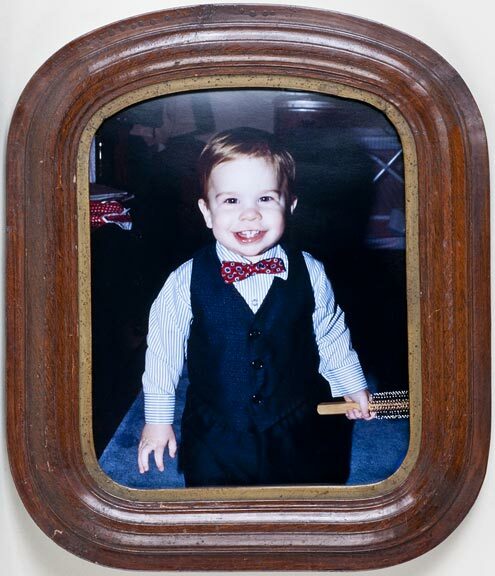 The frame is 15 1/4 x 17 1/2 inches outside and holds an image that is 10 3/4 x 13 inches. 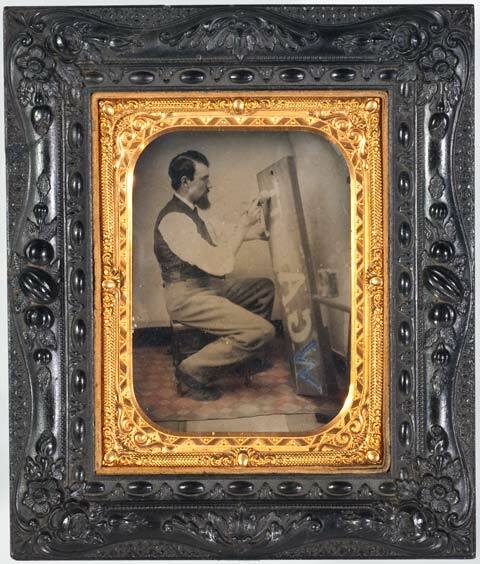 Better - A mid-1850s gutta percha photo frame with an ambrotype of a sign painter. 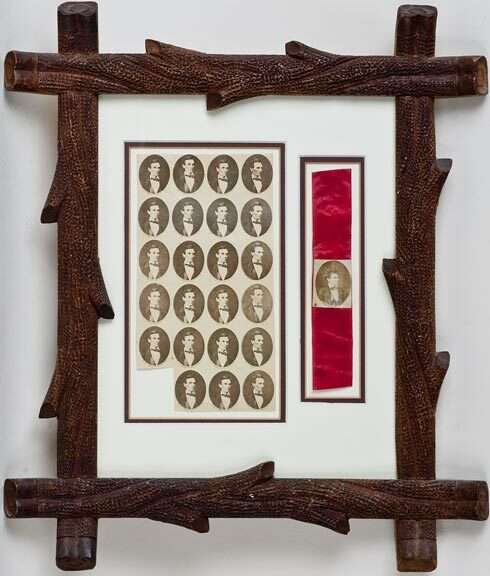 The frame is 5 1/8 x 6 1/2 inches outside and holds an image that is 3 1/4 x 4 inches. 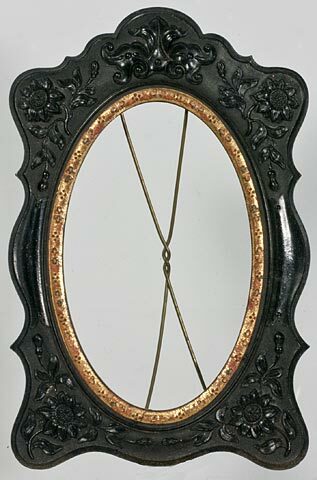 Better - 1860s gutta percha with a mourning drape design. 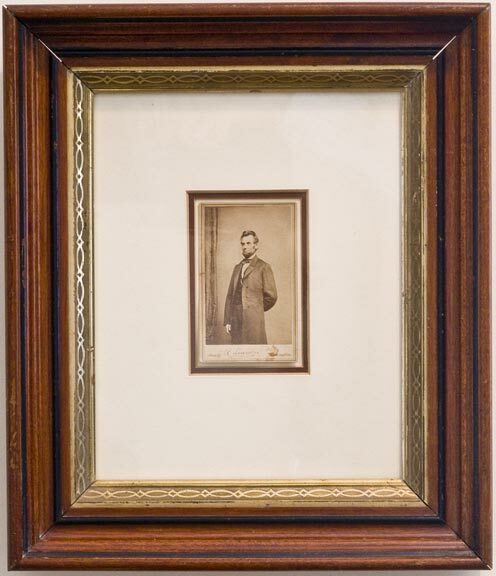 It was made to hold a CDV image. 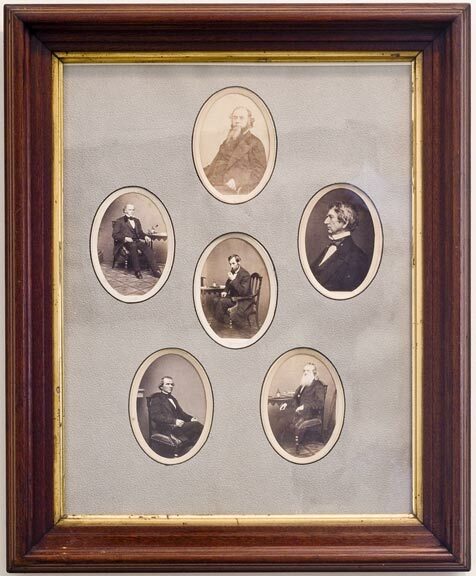 The carte-de-visite was introduced in the very late 1850s. 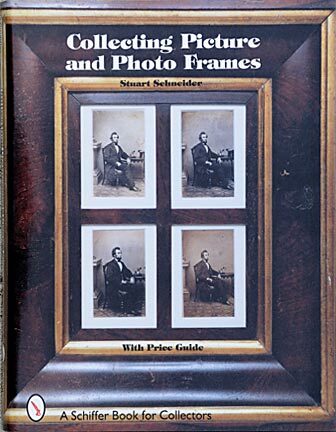 By 1860, it was the photograph format of choice and images were made by the millions. Better - 1860s gutta percha with a flower design. 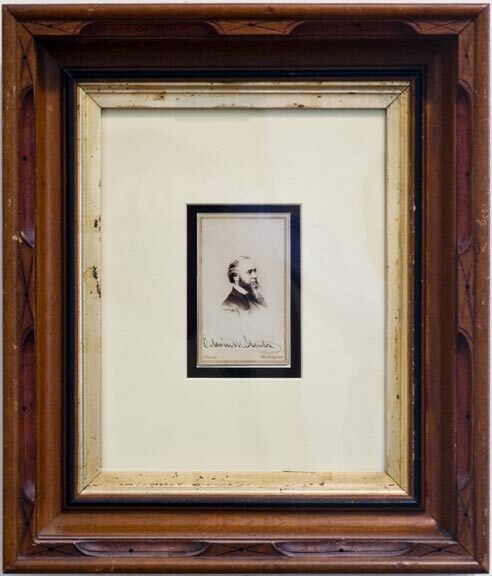 It was made to hold a CDV image. The 1850s brought in a refinement of the earlier styles. 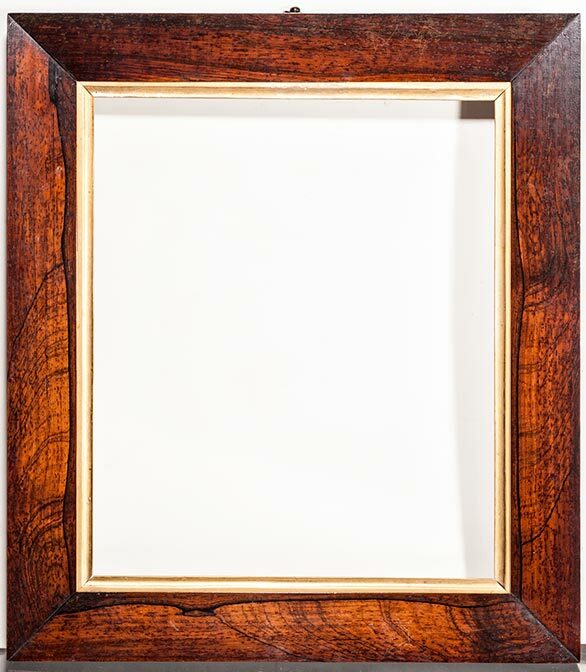 You will find that many antique dealers use the term "ogee" too freely when describing wood-veneer frames. Actual ogee pieces have an S-shape curve in the wood. 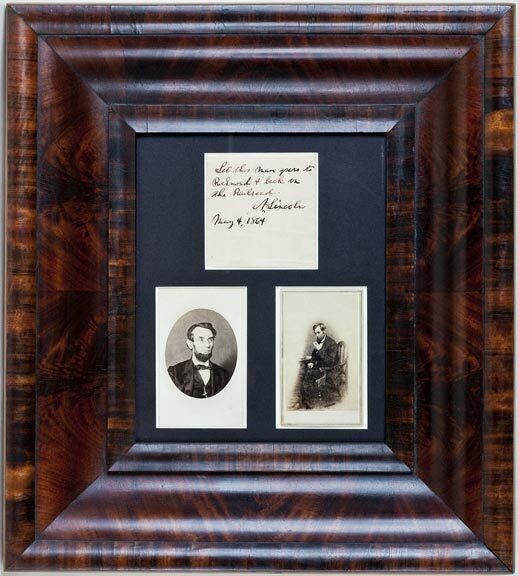 Better to Best - An ogee mahogany and walnut piece made to hold 4 CDV photographs. 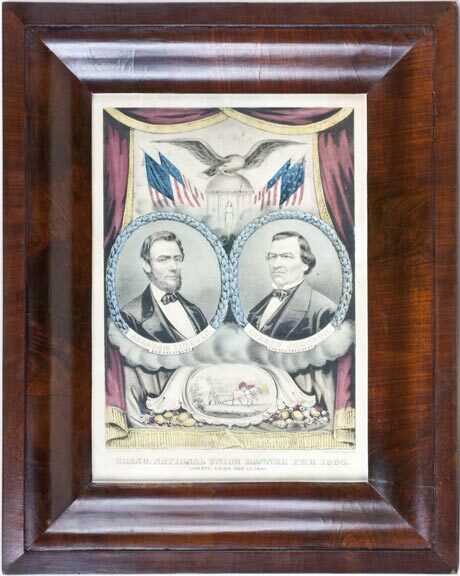 Made in the late 1850s to 1860s. It is 14 1/2 x 16 1/2" od. 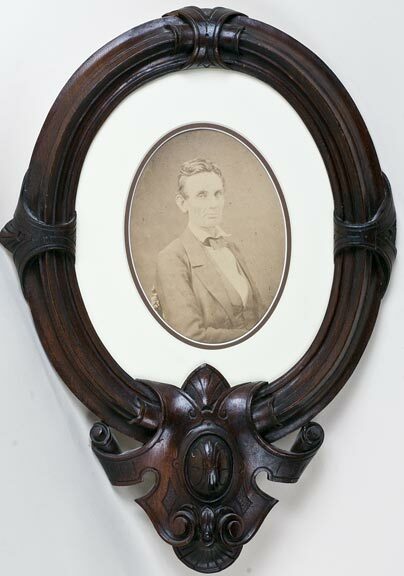 Better - An unusual carved walnut example to hold an oval photograph. Made in the 1860s. It is 13 x 18 1/2" od. 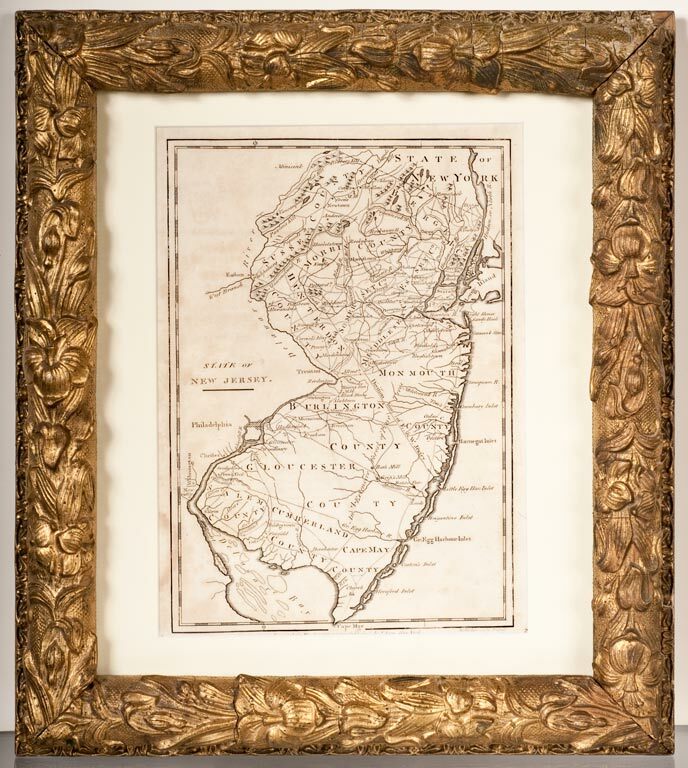 Better - A gilded, wood frame from the 1850s. 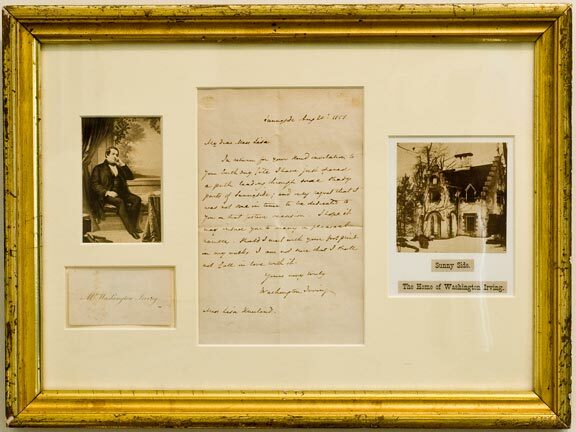 These are described as "honey-colored" or "lemon-gilded" frames. They are actively sought by collectors. 11 3/4 x 15 3/4" od. Better - A lemon-gilded wood example from the 1850s. They often show wear, but this just adds to their honest history. 11 1/2 x 15 1/2" od. Better - Amish-made, a nice wood, outside boarder, inside mound (known as a cushion) with feet, and a nice site edge. 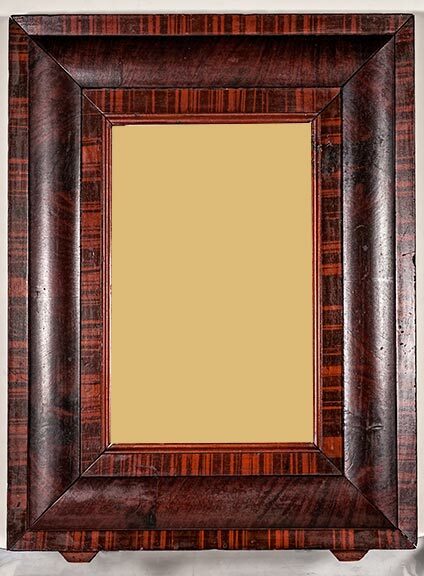 Similar-to-an-ogee, Pennsylvania mahogany veneer & faux bois frame from the 1850s. It is 17 x 22 inches od. and has a 14 x 19.25 inch pic. size. Best - Ogee pieces can be found in many grades of wood. The better the quality of the wood, the better the piece. 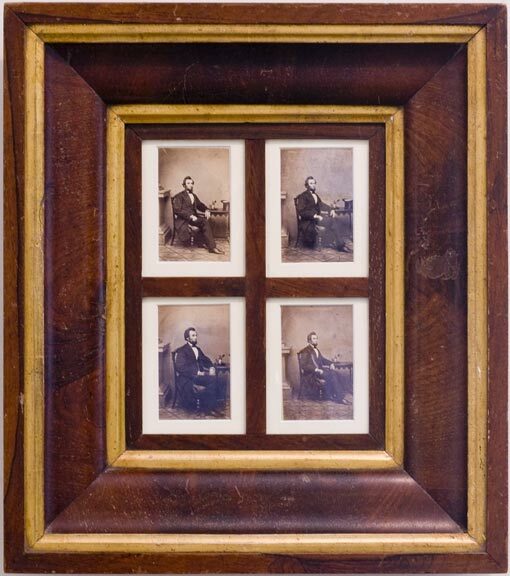 A high quality, ogee, mahogany-veneer frame from the 1850s-1860s. It is 20 1/8 x 22 1/8" od. 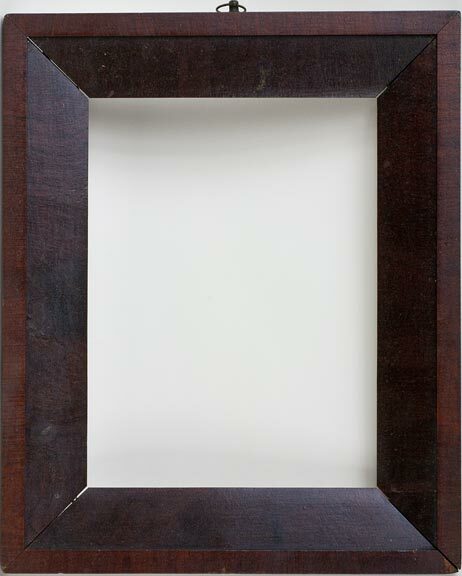 Best - A similar-to-an-ogee mahogany and walnut-veneer frame from the 1850s-1860s. It has great quality wood and is 18 3/4 x 25 1/4" od. 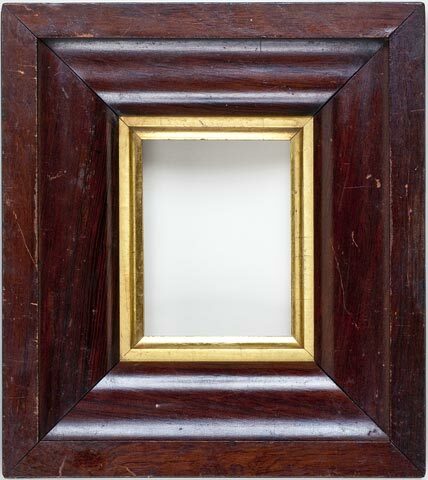 Best - A ogee mahogany-veneer frame from the 1850s-1860s. It has great wood and is 21 3/4 x 30 3/4" outside and 13 1/4 x 22 1/4 inches pic. size. 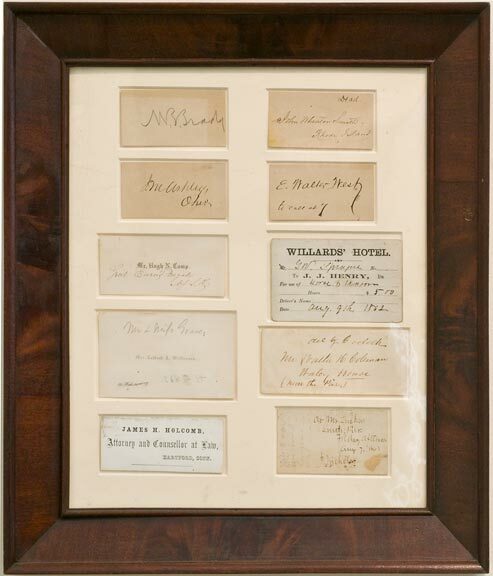 Best - The highest quality, ogee, mahogany-veneer piece from the 1850s-1860s. The wood is richly figured and artfully assembled. It is 14 3/8 x 16 1/4" od. Better - An ogee, mahogany-veneer with a tiger-stripe faux bois application on the inner and outer edges from the 1850s-1860s. It is 17 x 22" od. 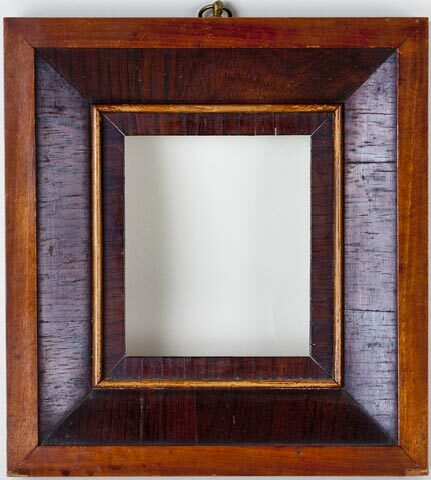 Better - An unusual, fruitwood, ogee piece from the 1850s-1860s. 10 1/2 x 11" od. 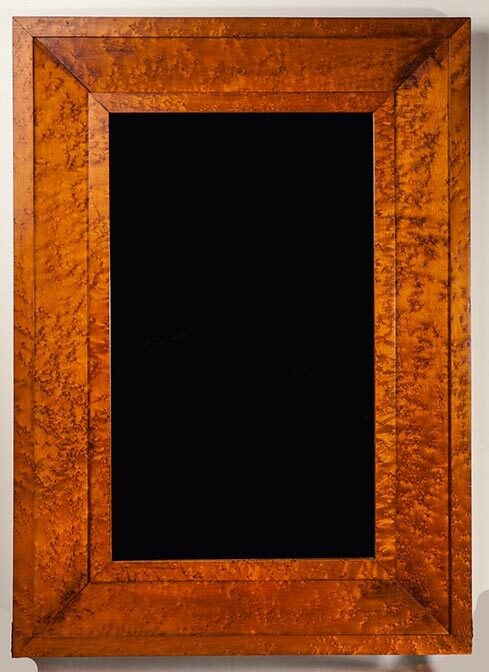 Better - A nice quality, ogee mahogany-veneer-from the 1850s-1860s. It is 8 1/2 x 9 1/2" od. Better - A heavy piece with gilded flowers from about 1860. It is 14 x 16" outside and has an 8 x 10" rabbet. 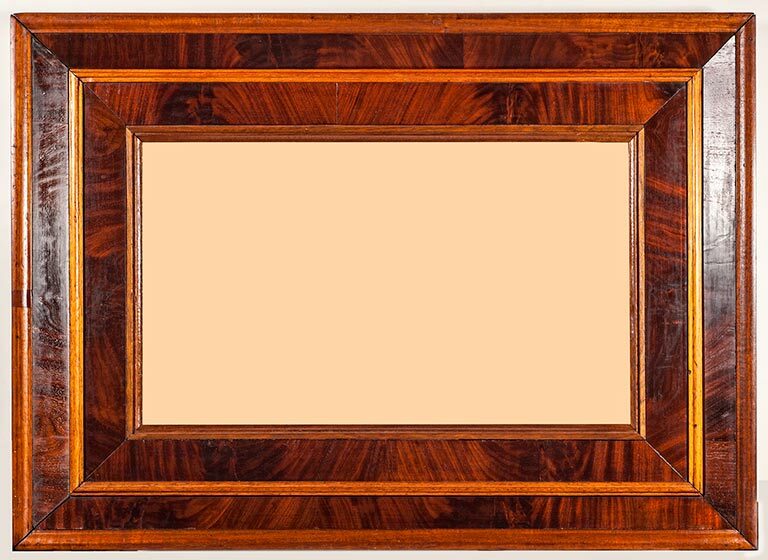 With the coming of the 1860s, American frame makers began to rely upon the more readily available supply of walnut wood for their frames. 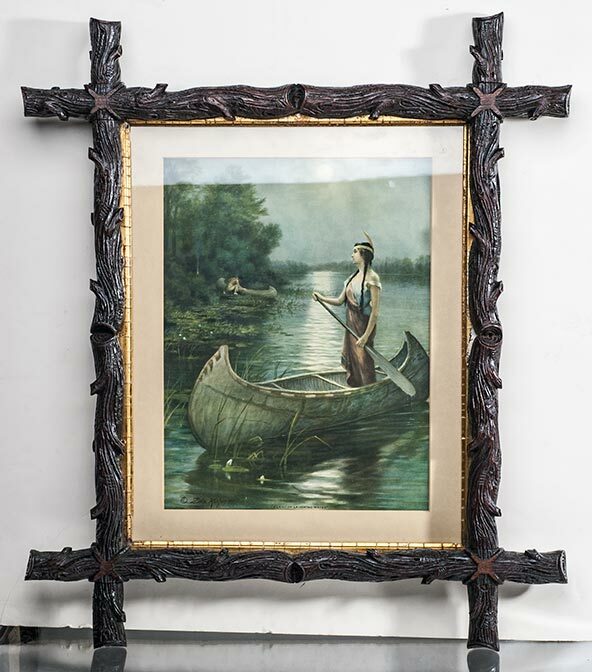 There is no shortage of good walnut frames available to the collector. They can be found in all sizes. 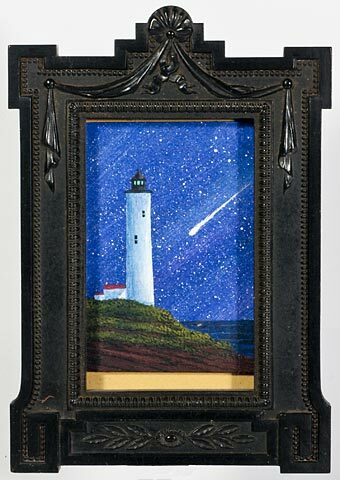 Look for good quality in the gilded finish of the "sight" (the inner edge of the frame that touches the picture). Good - Walnut with a decorated sight from the 1860s. 11 1/2 x 13 3/4" od. Good - Walnut with a plain sight from the 1860s. 14 x 17" od. Good - An unusual walnut, arched example from the 1860s-1870s. 11 3/8 x 13 3/8" od. Good - Walnut with a decorated sight from the 1860s. 15 3/8 x 17 5/8" od. 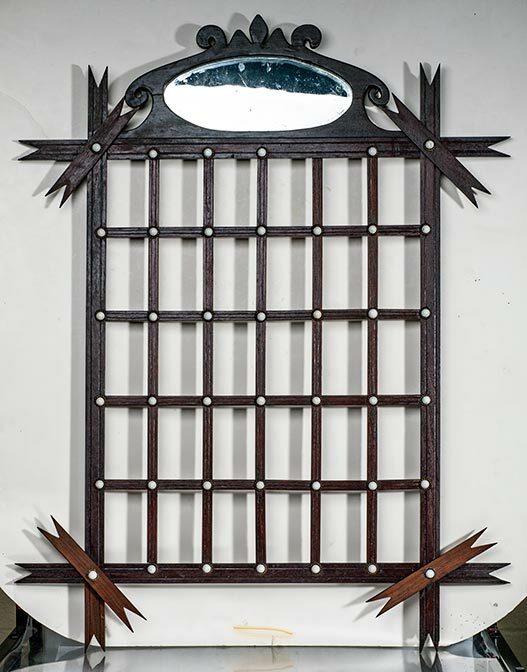 Better - A rustic, branch, mahogany example from the 1860s. It is 11 3/4 x 14 3/4 inches od. 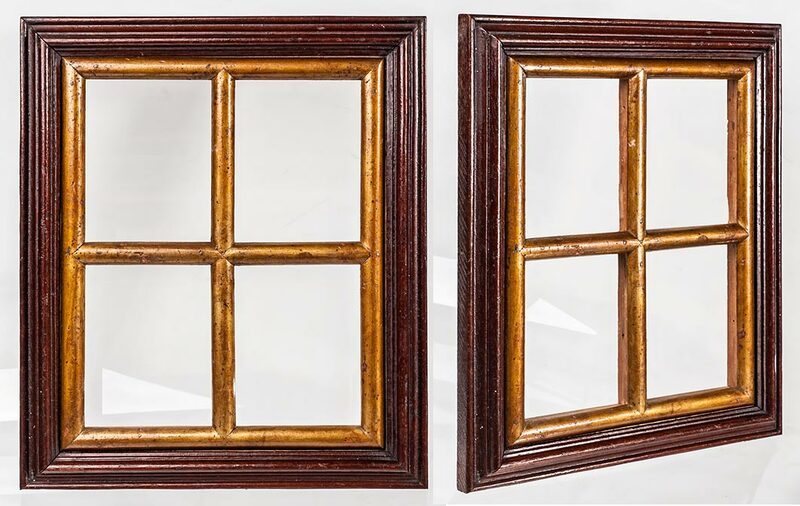 Best - A walnut, rustic piece with a decorated inner molding is from the 1860s. 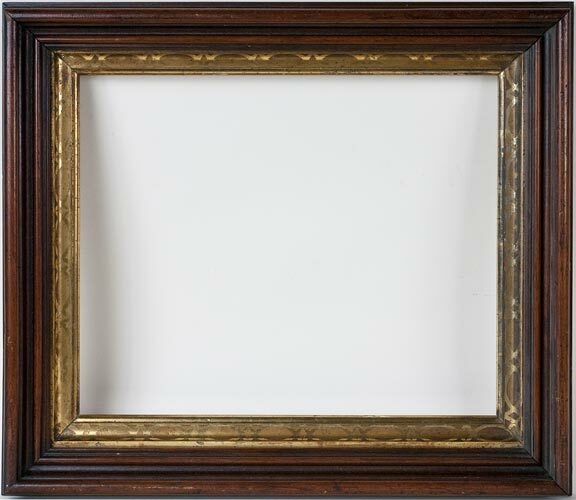 This is a rare frame because of the decoration on the gilded area. A naturalist movement was beginning the art world in the mid-1860s and this design was supposed to represent pebbles at the bottom of a stream. 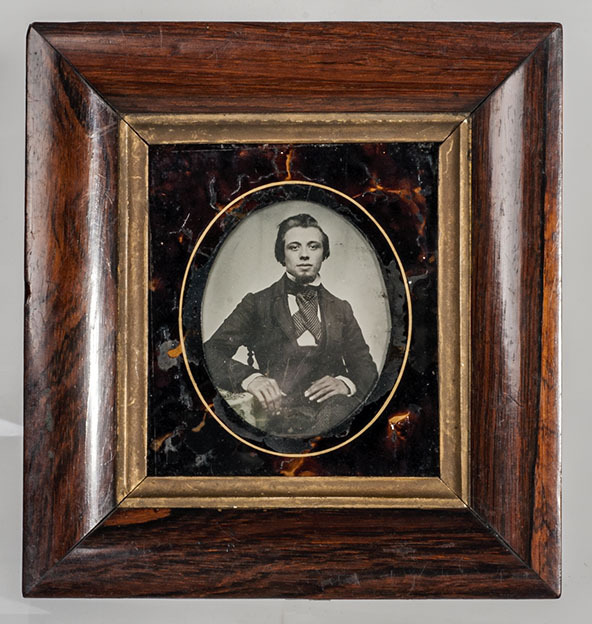 The style was gone by the end of the 1860s. It is 11 x 12 1/2 inches od. 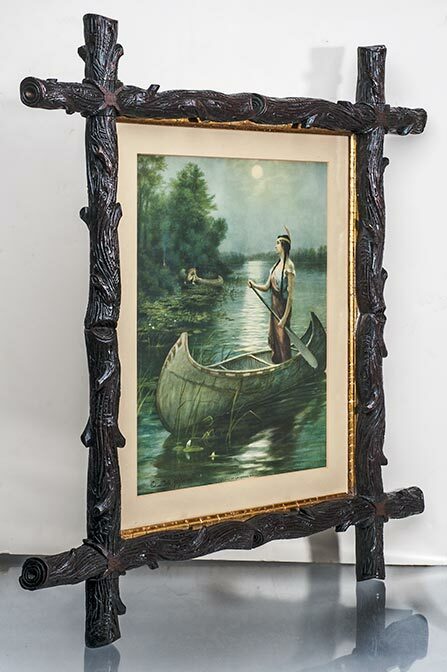 Best - A larger, walnut, rustic piece with highly detailed carved branches and a gilded sight. It was probably made at the end of the 1860s to possibly 1870. It is 19 x 22 inches od. with a 12 x 15 1/8 inch pic size. Best - Like a 4 tier birthday cake, this beautiful, deep, walnut example is a piece of folk art. It dates to the late 1860s, possibly early 1870s. It is 17 1/2 x 15 5/8" outside dimension, image size is 10 x 12". Better - Walnut with a gilded sight from the late 1860s. The carved & decorated wood gives it leg up on most walnut examples. It is 12 3/4 x 14 3/4" od. Good - Walnut made up with crisscross pieces with porcelain buttons from the late 1860s-1870s. 15 x 17" od. Home | Links | Wordcraft.net Copyright 2015 - 2019 by Stuart Schneider. Do not use any parts of these pages without written permission.